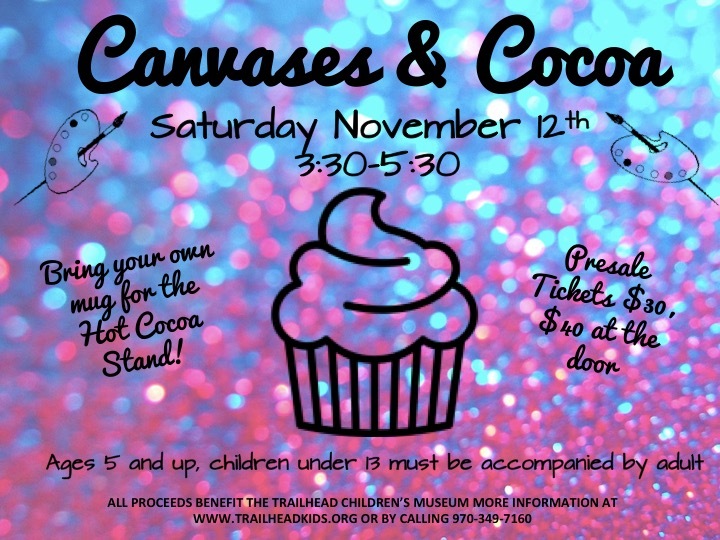 The Trailhead Children’s Museum present’s the first in a series: CANVASES AND COCOA – a family painting event! Create your own masterpiece of a glittery cupcake! Parents and Children ages 5 and up are invited to collaborate on one canvas or create a matching series. All materials and Hot Cocoa are provided, just bring your own mug! Tickets are available online at trailheadkids.org or at the door. For more information you can email Holly at [email protected] or call 970-349-7160. Children under 13 must be accompanied by an adult.